presentations, please let me know. Network) as part of an effort to standardize subscriber services. ensuring that ISDN networks easily communicate with one another. rather than the telephone company. • Unlike POTS, ISDN is digital from end to end. requires PCM (Pulse Code Modulation) - explained later. Each B channel provides 64 kbps of bandwidth. other site in the ISDN network. 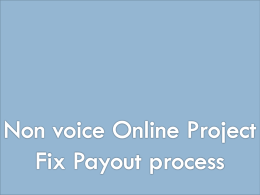 ISDN lines can be used in conjunction with PPP encapsulation. 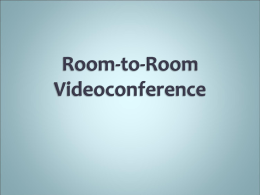 • Bottom line: ISDN, in its current form, is no longer a “firstchoice” technology. Why 64Kbps channels and what is PCM? • This will be explained in a later presentation on T1. a link (an analog call which has been digitized). E Protocols – Recommend telephone network standards for ISDN. 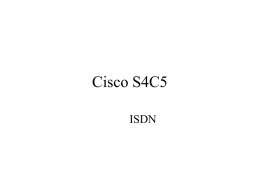 For example, international addressing for ISDN. I Protocols – Deal with concepts, terminology, and general methods. • The second channel type is called a delta channel, or D channel. 64 kbps for the Primary Rate Interface (PRI). • The B channels can be used for relatively high-speed data transport. HDLC or PPP as the Layer 2 protocol. information called the connection setup. – Both the control information and the data share the same pathway. – This is called in-band signaling. – This is called out-of-band signaling. teardown, to control calls on B channels. the D Channel (LAPD) protocol. LAPD is a data link layer protocol based on HDLC. Layer 3 Q.931 I like the “older” chart. link, and network layers of the OSI reference model. ITU-T I.430 and I.431, respectively. I.450 and ITU-T Q.931, also known as I.451. • These standards specify user-to-user, circuit-switched, and packetswitched connections. whether the frame is outbound or inbound. where they get TE and NT from. 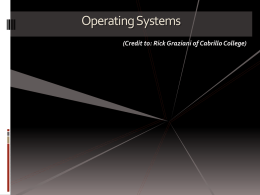 – Outbound frames use the TE frame format. – Inbound frames use the NT frame format. • ISDN BRI frames contain 48 bits. The LAPD flag and control fields are identical to those of HDLC. The LAPD address field is 2 bytes long. LAPD services are provided to Layer 3. The second byte contains the terminal endpoint identifier (TEI). dynamically assign it when the equipment is started up. – Statically assigned TEIs range from 0 to 63. – Dynamically assigned TEIs range from 64 to 126. – A TEI of 127, or all 1s, indicates a broadcast. • Where you see this information. These functions are implemented in the Q.931 protocol. • The following information discusses “some” of these steps. pass the called number to the remote ISDN switch. The remote ISDN switch signals the destination over the D channel. the other B channel available for a new conversation or data transfer. Both B channels can be used simultaneously. two devices needs to be well defined. the interface. Know what type of interface your router has! which the switch is being used. configured for the switch type used at the CO. 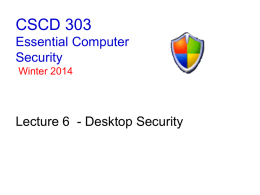 This information must be specified during router configuration. Switch types used for router configuration. (SPIDs) are assigned by the telco. configuration of the BRI service. to share the local loop. • SPIDs are required by DMS-100 and National ISDN-1 switches. • SPIDs are used only in North America and Japan. SPIDs identify each B channel to the switch at the central office. 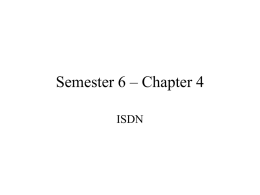 initialization will fail, and the ISDN services cannot be used. command, to reflect an alternate switch type. The most common Layer 2 encapsulation protocol is PPP. • One SPID is supported for each B channel. both SPIDs, one for each B channel. • Data and voice cannot run over the same B channel simultaneously. the ISDN phone number in the SPID naming system. • The optional ldn argument defines a local dial directory number. coming in from the ISDN switch. SPIDs are specified in interface configuration mode. used by the provider to which the PRI connects. command (unless there is a separate CSU/DSU). called a T1 controller, or an E1 controller, if an E1 line is being used. Within an E1 or T1 facility, the channels start numbering at 1. The numbering ranges from 1 to 31 for E1 and 1 to 24 for T1. 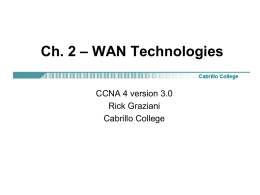 Serial interfaces in the Cisco router start numbering at 0. Thus, interface serial 0/0:23 refers to the D channel of a T1 PRI. class but will be discussed in a special presentation on T1. discusses framing and line coding. inspect the status of the BRI interfaces. ready to make or receive calls. interface configured on the router. number at the end of the command. – The B channel is using PPP encapsulation. – LCP has negotiated and is open. Exit inter DDR? If so, traffic interesting? Transmit both interesting and noninteresting traffic. route to the destination, and identifies the outbound interface. map to access the next-hop router. through the BRI using the D channel. After the link is enabled, the router transmits both interesting and uninteresting traffic. Uninteresting traffic can include data and routing updates. timeout period and disconnects the call based on the idler timer configuration. remain connected if no interesting traffic has been sent. However, only interesting traffic resets the idle timer. hellos from resetting the idle timeout. be sent over your DDR link, then use the passive-interface command . interface and needs to be associated with the DDR interface. This is done using the dialer-group command on the interface. identifies the dialer list to the router. be specified. This is done using the dialer map command. • Cisco IOS commands often contain the word "map". Layer 3 next-hop-address to its Layer 2 address, DLCI number. linked to a dialup Layer 2 address. In this case, the dialup Layer 2 address is a phone number. Routing Table lookup of incoming traffic determines bri 0 is the exit interface. Traffic is determined whether or not to be interesting. If interesting, dialer map is used to find next hope router. important to use PPP authentication. number of idle seconds before a call is disconnected. disconnected after the last interesting packet is sent. authentication for router to accept the call. cannot be the one to initiate a call. and chat-scripts, you can use the dialer string command. the other, but at some point I need to get a life. • This is also true when using ISDN with dialer map statements. This command is an alternate command to the dialer map command. vary between a number of possible routers in a pool. • Some of this can be difficult to understand at first. dialer profiles and to provide more examples. Legacy DDR is powerful and comprehensive. However, the limitations of legacy DDR can inhibit scalability. interface to one per-destination call specification. address, one encapsulation type, and one set of dialer timers. • Legacy DDR configuration uses dialer map statements. responsible for calling one destination. two DDR interfaces at each end of the link. only a few minutes daily. Call parameters are on an asneeded basis. a specific use with a permanent configuration. characteristics based on incoming or outgoing call requirements. 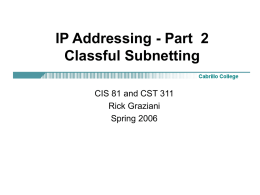 – Configure B channels of an ISDN interface with different IP subnets. 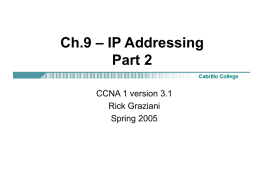 – Use different encapsulations on the B channels of an ISDN interface. multilink PPP are all configured on the physical interface. parameters on an as-needed basis. can apply to multiple physical lines. The dialer interface is not a physical interface. parameters configured for the dialer interface. 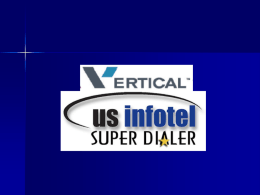 Dialer interfaces provide flexibility through dialer profiles. Multiple dialer interfaces may be configured on a router. associates this logical interface with a pool of physical interfaces. priority of the interface within a dialer pool. then the dialer pool with the highest priority is the one that dials out. pool 1 and the call is made to 5551111.
this to an exit interface. next hop.” Not the complete story. the call can be made to 5553333.
which dialer profile to bind to BRI0. See curriculum for other options. and authentication (CHAP and PAP). participating in the same dialer pool. lowest priority value (which is the highest priority) will be tried first. The layer 2 encapsulations and authentications must match. layer 2 encapsulation and authentication on the dialer interface is used. Go to Cisco’s web site for more information on this feature. three layers of the BRI interface. up,” so that they stay in the routing table. Encapsulation PPP, loopback not set. . . . .
call setup exchanges for both outgoing and incoming calls. 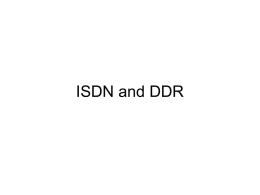 ISDN problem is the cause, as opposed to a DDR problem. problem with the ISDN carrier network. attempt to dial into the remote router. spid1 and isdn spid2 commands on an interface.